It is impossible to prepare for every eventuality in a trip like this, but in the months leading up to my departure, I tried my hardest. A compacted timeframe, two weeks, necessitated that most logistical issues go smoothly so that I wouldn’t waste any time on the road. There would be no apprehensive days spent waiting for a Chilean holiday to end so I could buy food. No relaxing weeks spent in Southern Thailand waiting for Sophie to finish up at her teaching post. 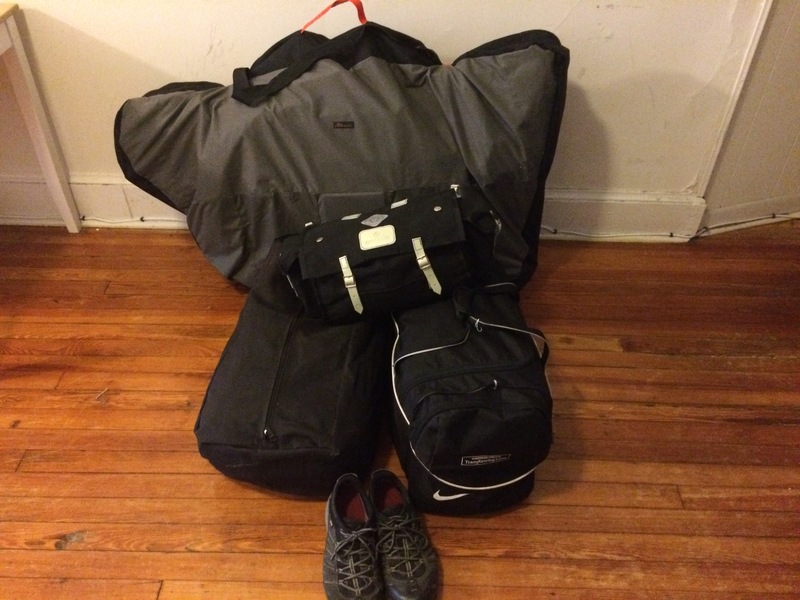 I had two weeks off from work, and I was determined to not let poor planning rob me of a second on the road. 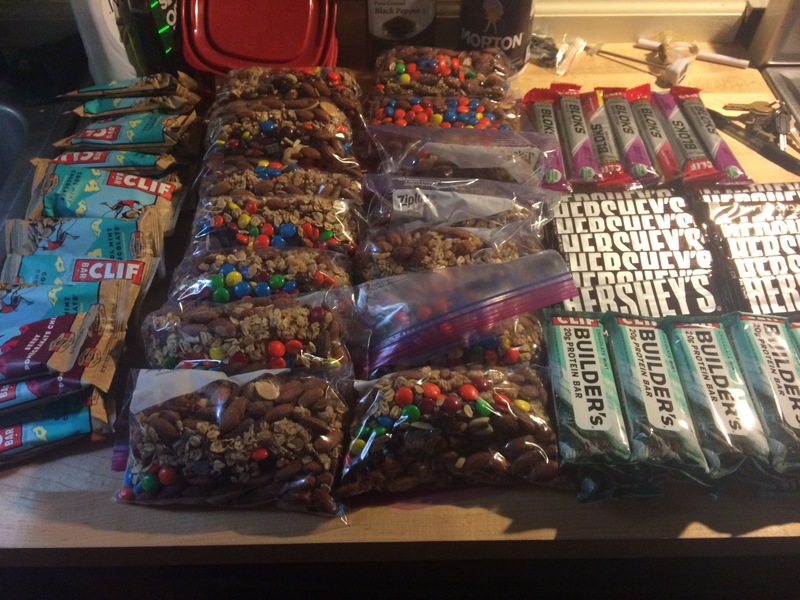 This is just my daytime food. Not pictured are my dinners and breakfasts. I probably spent more time trying to foresee every possibility and planning this trip than I spent on all of my other tours combined. New bike, new battery pack and solar panels (great idea, by the way!). New tent, funded by my very nice reliable source of income. 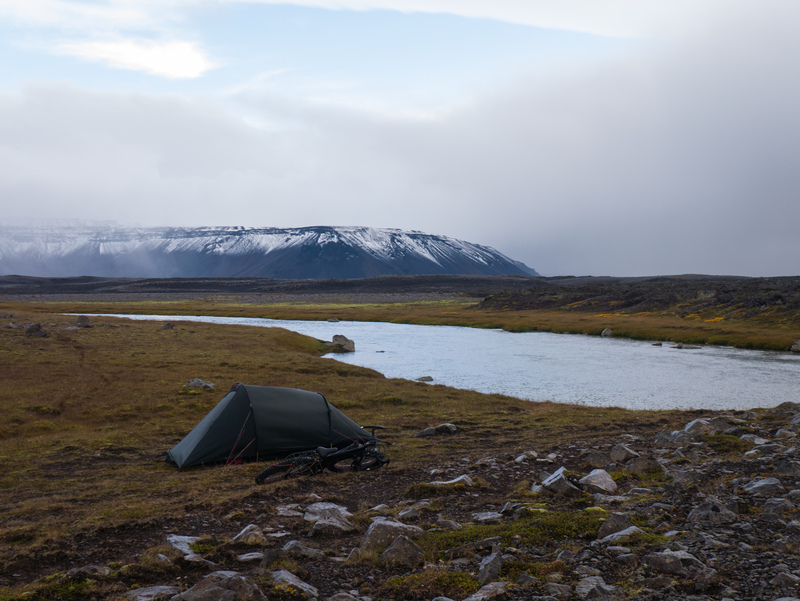 14 days of food prepared, routes researched, locals and previous tourers reached out to for advice, bike shops listed and contact info obtained, map printed, emergency huts scouted. There wouldn’t be many people in the highlands during this time of the year, let alone on a bike, and the weather would be poor. These facts were mentally prepared for. Come September 16, I was ready. 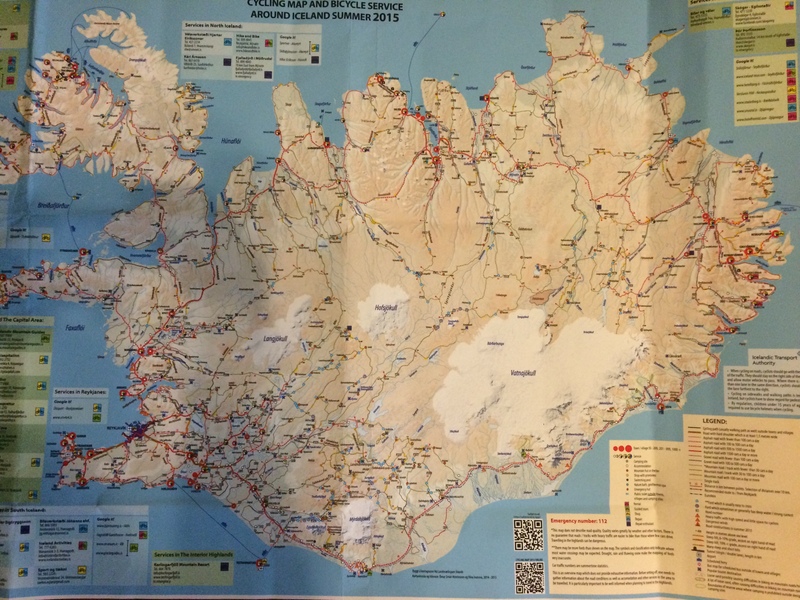 If you’re going to Iceland on a bike, find this map. It is accurate down to the building in the highlands. Reykjavik. See how ready I am? So much time spent considering shorts and cycling tights vs. rainproof pants. Shorts were fine. 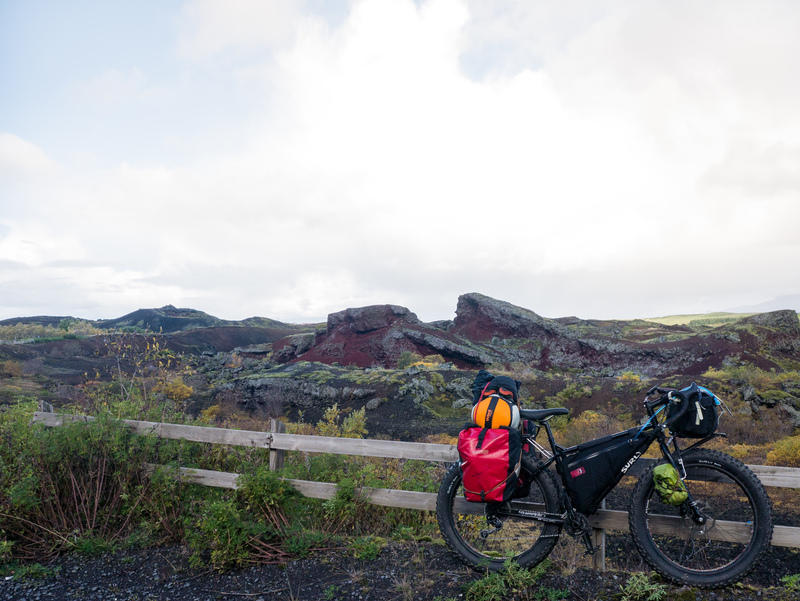 Then, 50km outside of Reykjavik, my chain snapped. Creeks run dry when you need water. A mosquito gives you dengue fever. That hill on your map isn’t really a hill, it’s more of a mountain, and there’s no way you’re not getting over it in the twilight. That road marked on two maps is actually a mix of a horse path and 4×4 track that is 3km away from where your map says, you just ran out of water and it’s getting dark. Your tent leaks. Your gloves and jacket aren’t actually waterproof. There’s no protein in Eastern Cambodia and you’re not particularly fond of that wonderful Cambodian speciality “Roadside Chicken Feet Water” with a side of lukewarm sugarcane juice from a dirty plastic bottle. I ended up taking a last minute early flight out of DC after arriving very early for my scheduled flight. My planned flight got me in at around 6am, and now I would get in at 11pm the night before. 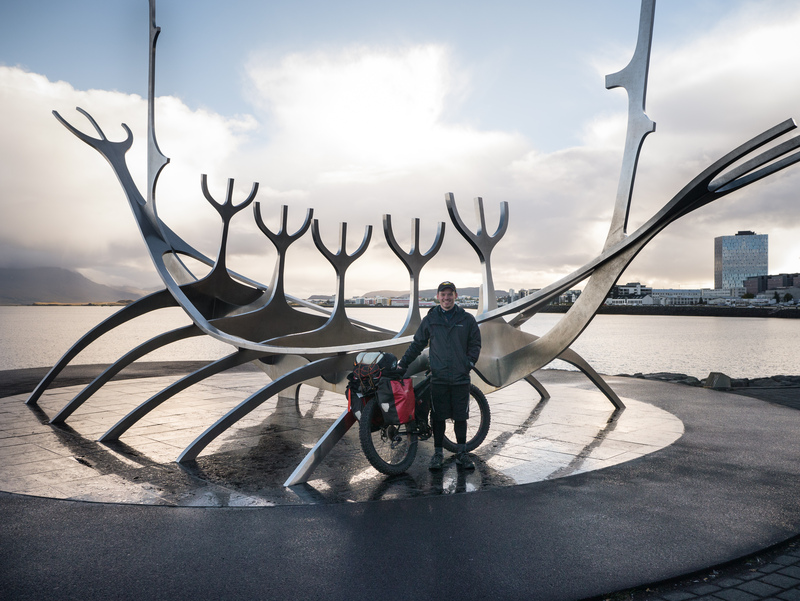 I had no hotel booking, so I sort of threw caution to the wind and tried to get excited at the prospect of a midnight ride to Reykjavik. The TSA, however, had different plans. They apparently don’t like when someone shows up 45 minutes before departure with 100lbs of luggage. 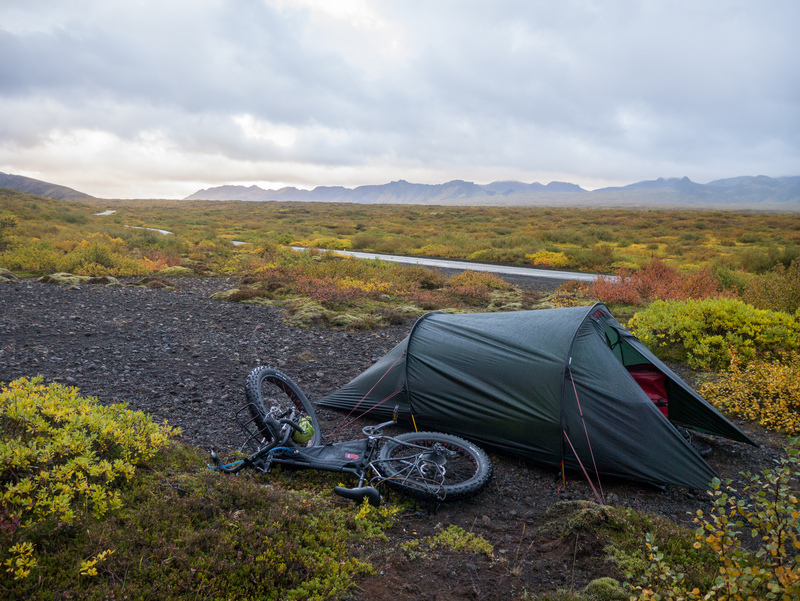 So long story short, I made the flight, but my bike didn’t, and I spent an uncomfortable sleepless night at the Keflavik airport worried if I would even be able to get started on the morning I’d originally planned. Finally, A jolt of adrenaline at 6am when my bike arrived on the next flight. 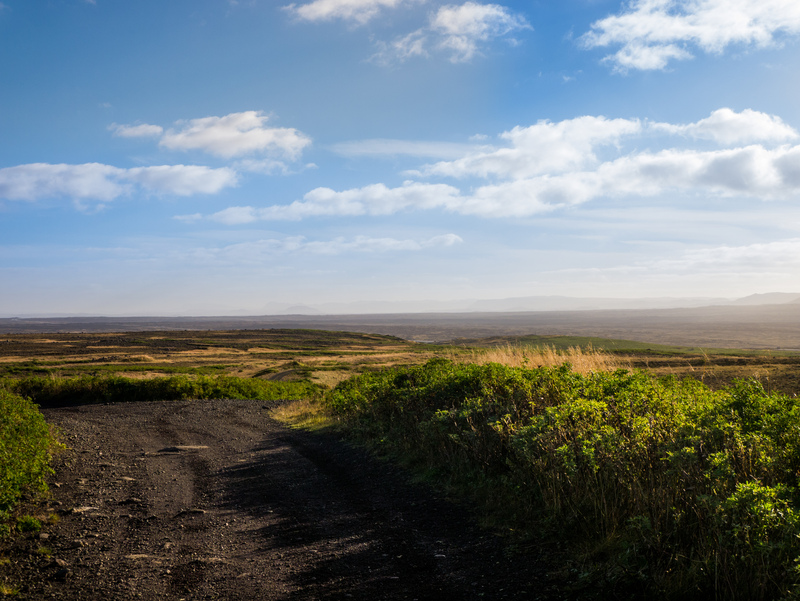 After a quick assembly outside the Keflavik Airport, I hauled my sleep-deprived self off onto some back roads along the coast towards Reykjavik. I was feeling fine. The weather was wonderful, and after a night in traveler purgatory, I was finally on the road. A wonderful thing at Keflavik Airport. 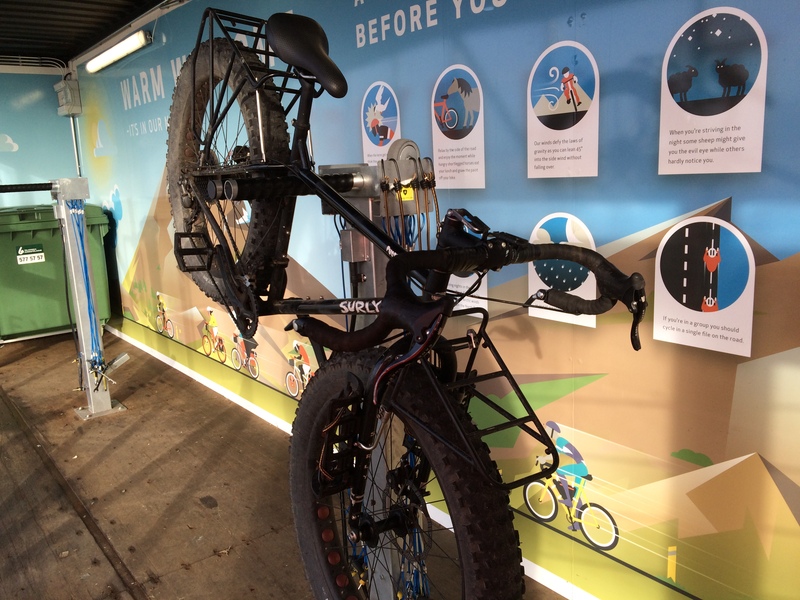 a heated bike stand with tools. Apparently this is a common thing to do. 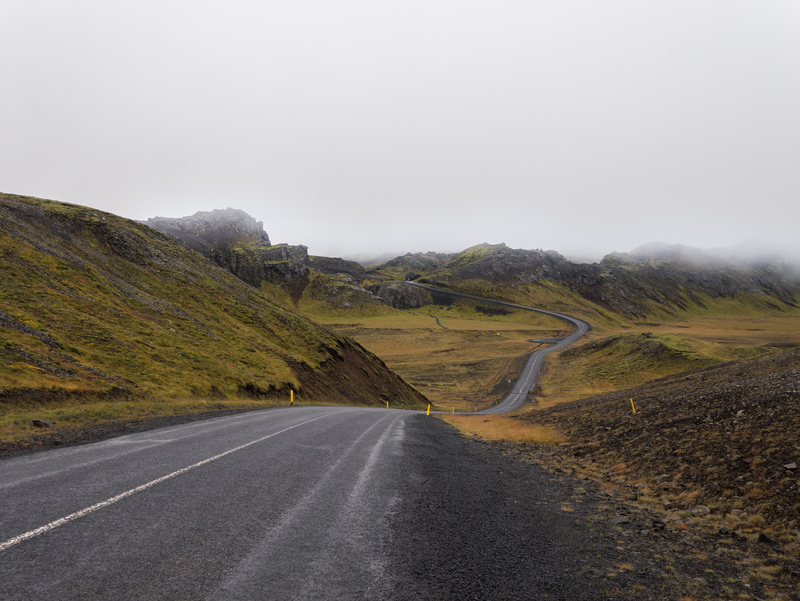 Reykjavik is a cyclist’s paradise. About 5km outside town, the first separated bike path starts, and from there an incredibly expansive web of paths, some following roads and many not, expands across the city. The city is entirely navigable by paved path. Would you expect a small Scandanavian Capital to be any different? 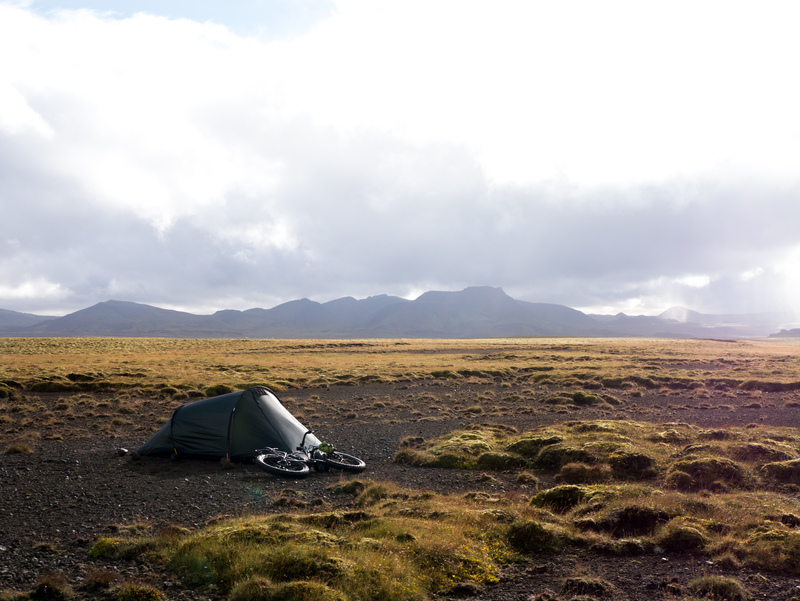 After a night at the main Reykjavik travelers campground I dropped my luggage bags at a bike shop and made a beeline for the interior. At last! On tour! On a fat bike! 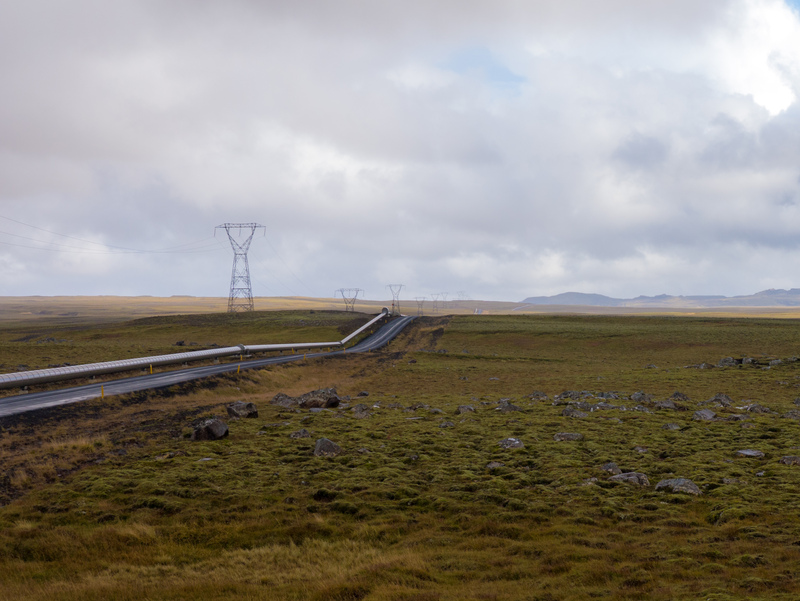 This pipeline carries hot water to Reykjavik. It starts with a subtle clicking. Not really worrisome. I’m usually in tune with these things, but not this time. Going up a hill I shifted gears a little too quickly and suddenly snap. There it goes. It’s the weak stock chain that came with the bike, and now it’s on the ground behind me. Two options. Call for a new chain (I had brought a list of shops) or try to fix it and go on. It was past closing time for many of the shops in Reykjavik, so I wasn’t going to be able to get ahold of anyone until the morning, so I set up camp and got to work to see if I could fix it. 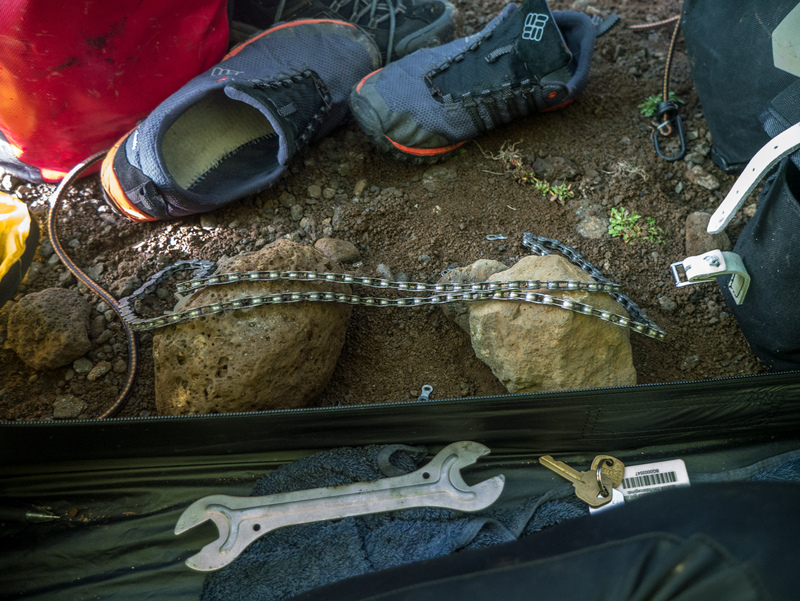 I broke out my tools to find that I had left my multi-tool, with it’s handy chain tool, at a rest stop outside of the Keflavik Airport. Strike two. Or three. Not sure. There were worse places to break down. Nonetheless, I forged ahead and using a combination of rocks and hex wrenches, removed the broken link and reassembled the chain. I was so proud of myself. The trip’s first obstacle. 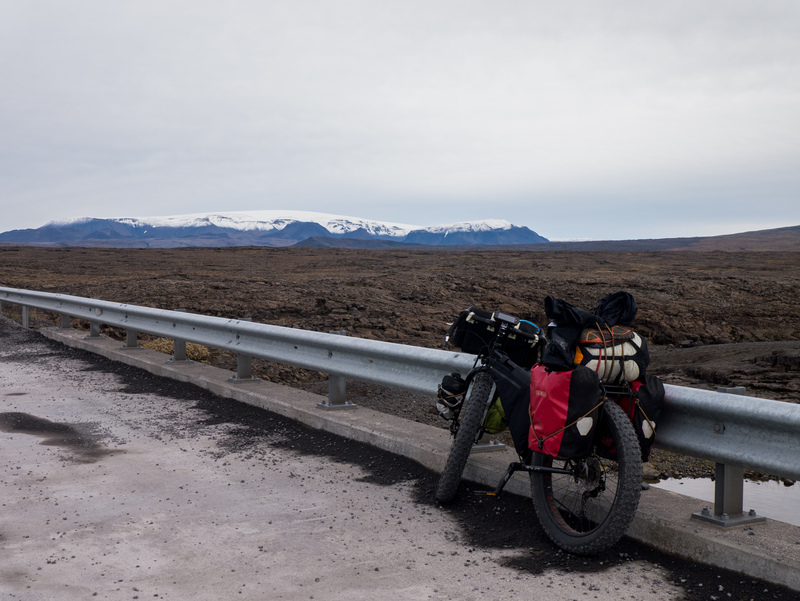 It was still okay weather, I was in Iceland, and while the bike’s aggressive tread was really a drag on the pavement, I was on my way. 50km and a day later, pop, and there it went again. This time there was no denying it. I needed a new chain. I was heading further away from civilization, and this chain had just had it. This time it had snapped in a different place, and I wasn’t about to set up my “tools” again. So I called a shop. The first shop quoted just an unreasonable price to drive a new one an hour to me the next morning. Damn. Next shop. “No, we don’t do that.” Damn. It was getting late, and the third and fourth shops were closed. So I set up camp, sidelined, feeling defeated, and took stock of my surroundings. Worse places, and all that. The chain-less bike in front of stunning fall colors. The long sunsets led to some great pictures. this one coming straight from the window of my tent. That’s not a volcano, it’s a steaming hotspring. The next morning I got in touch with a shop that quoted me, out of sympathy, a much more reasonable price. 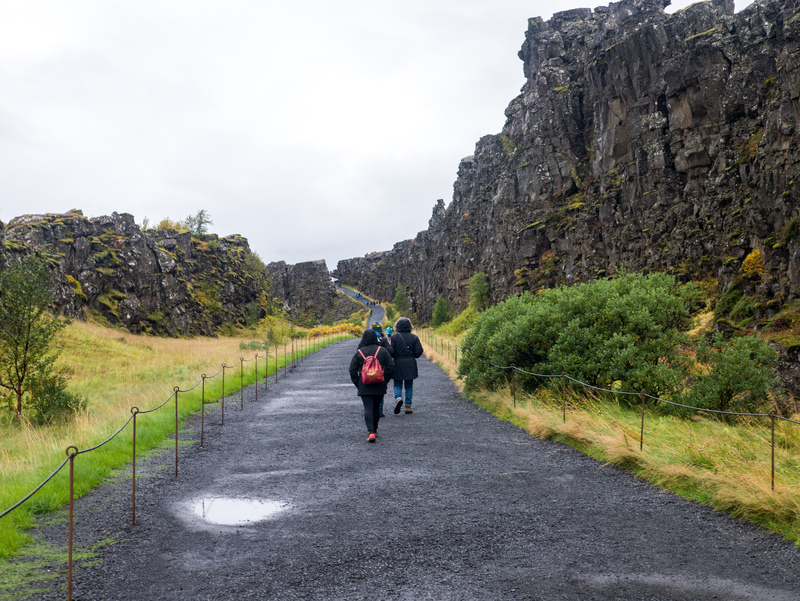 The taxi driver would only charge me one way since I was somewhat close to the tourist stop of Thingvellir, and I suppose he thought he could probably manage to get a fare going the other way. At 11am the next morning, the taxi arrived, and I thanked him profusely for the service. It was an expensive chain, but I really had no choice. It’s nice to be employed. Fortunately, that chain lasted me through the rest of the trip, so here ends the saga of Bryan’s chain. My first views of the Langjokull glacier. I set out to ride around it. Emergency huts, up in the highlands just in case the weather turns really bad instead of just bad. 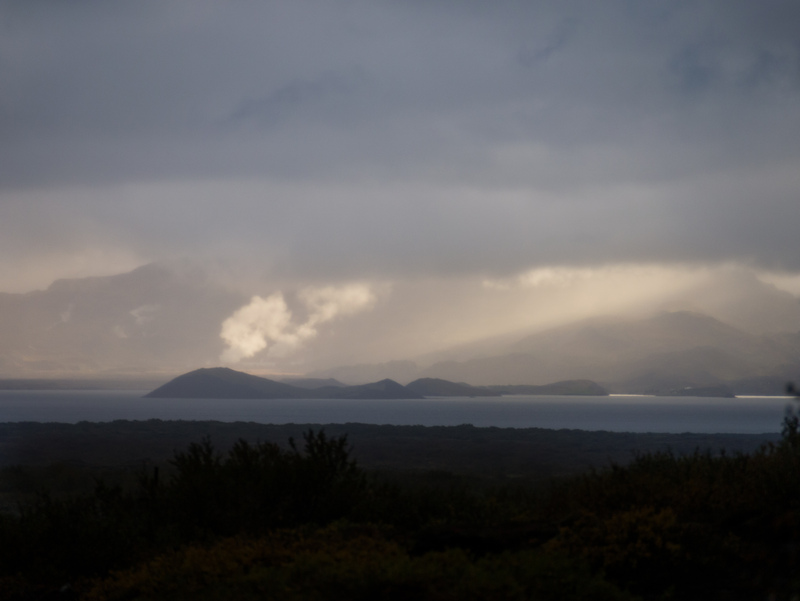 Then the weather turned bad, and didn’t get better until Part 2 of this post. 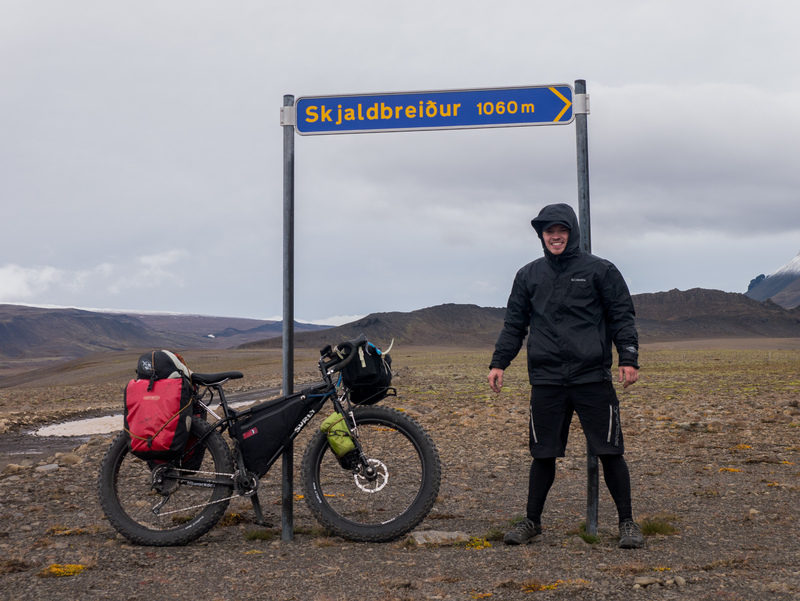 Anticipating a slight side/tailwind up and over Kaldidalur Pass, I was disappointed to spend the next day riding straight into a huge headwind with 30mph gusts straight at my face. 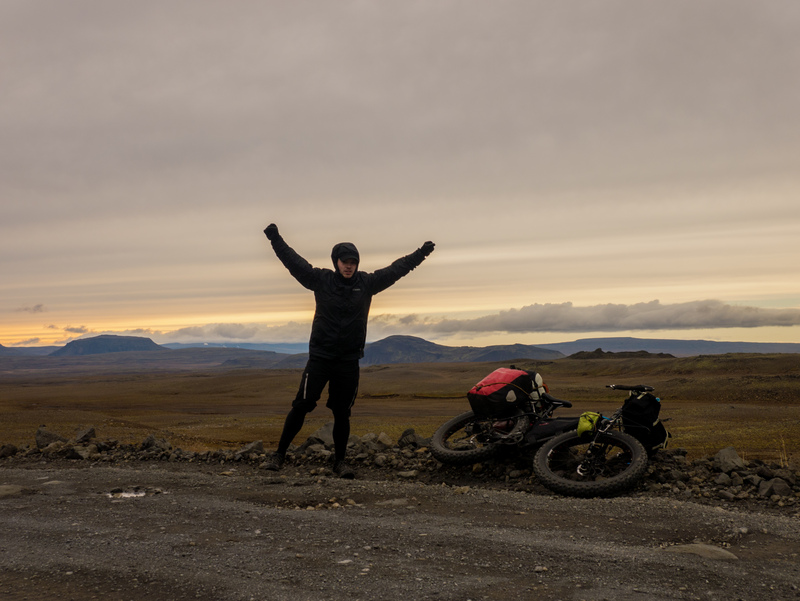 Road conditions deteriorated, and I found myself suffering through the first of many truly physically demanding days of the trip. 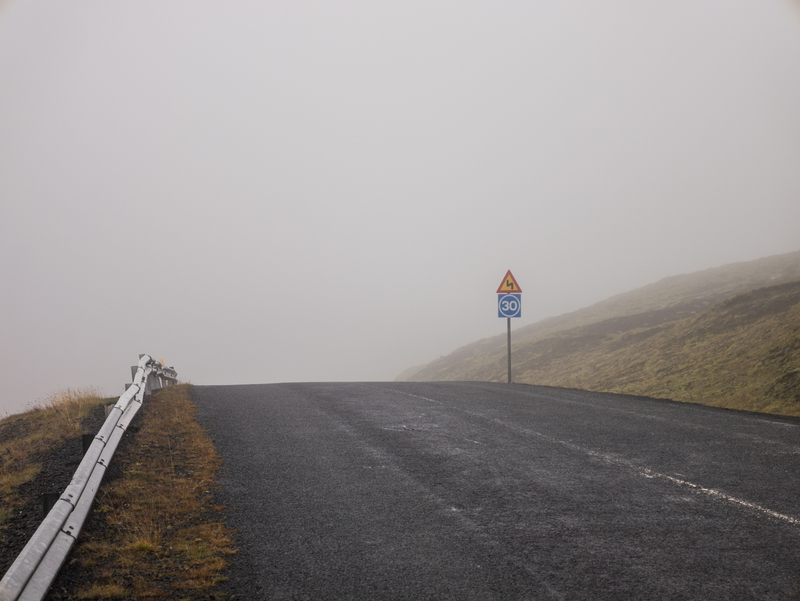 As the day went on, and I went higher, the rain fell quicker, the wind blew harder, and the road got worse. The rain stung, and the tourists in each passing car (very few passed. maybe one an hour up there.) looked at me with an increasingly concerned expression. Or just took their voyeuristic pictures of me and moved along. Bracing myself against the only thing taller than three feet out here. I had a tripod with me this time, so more pictures of me! I just remember the lighting was really strange this day. This must have been about 2-3pm. Higher and higher I go. 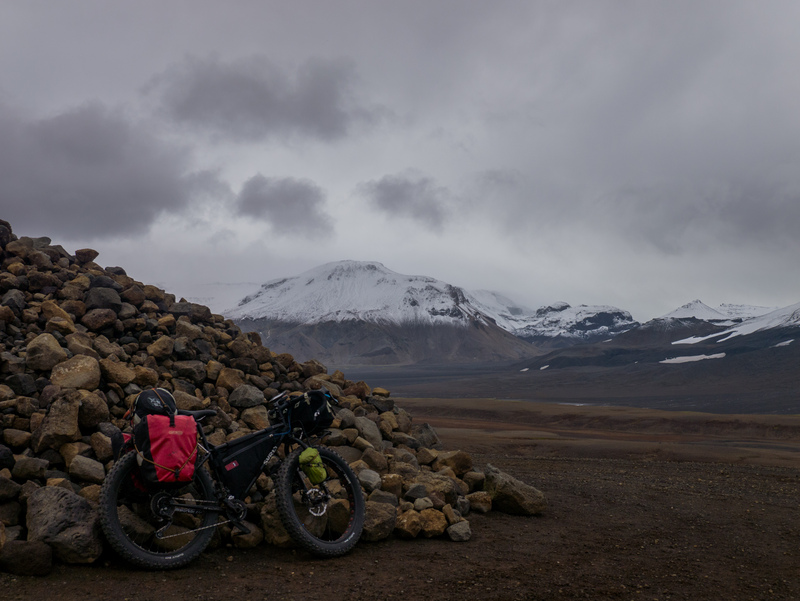 This was at the top of the Kaldidalur pass, probably only 750-800m in elevation, but it felt like so much more. What were they concerned about, I wonder? I was having the time of my life. It was stunningly gorgeous going up the pass. 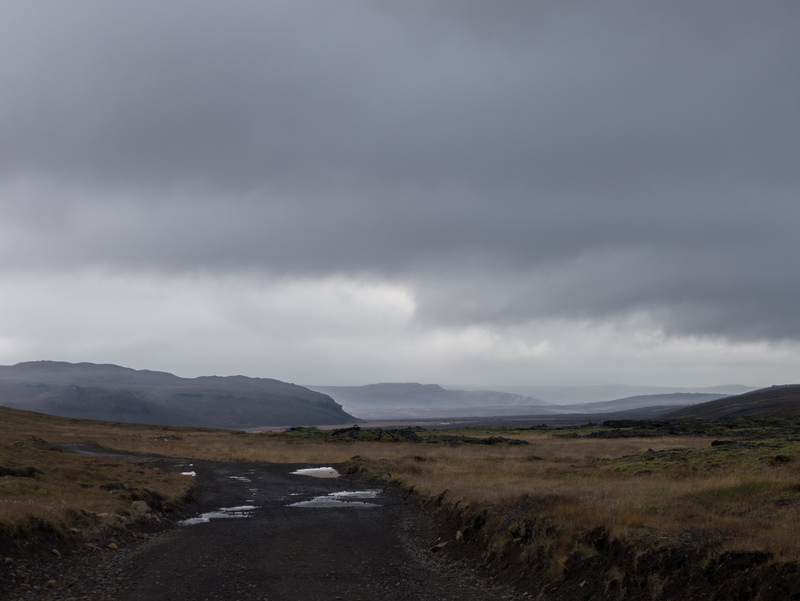 It was my first taste of the barren wasteland that is the Icelandic highlands, and it was awesome. The sun, never rising very high in the sky even in this season, came through the clouds and gave everything a gorgeous orange tint. That was, until it started raining, and everything turned grey. Wet, grey, and barren. Descending the pass was a gross chore, as the weather further deteriorated and each stream I passed seemed to be full of cloudy, undrinkable glacial sediment. No camping next to those. 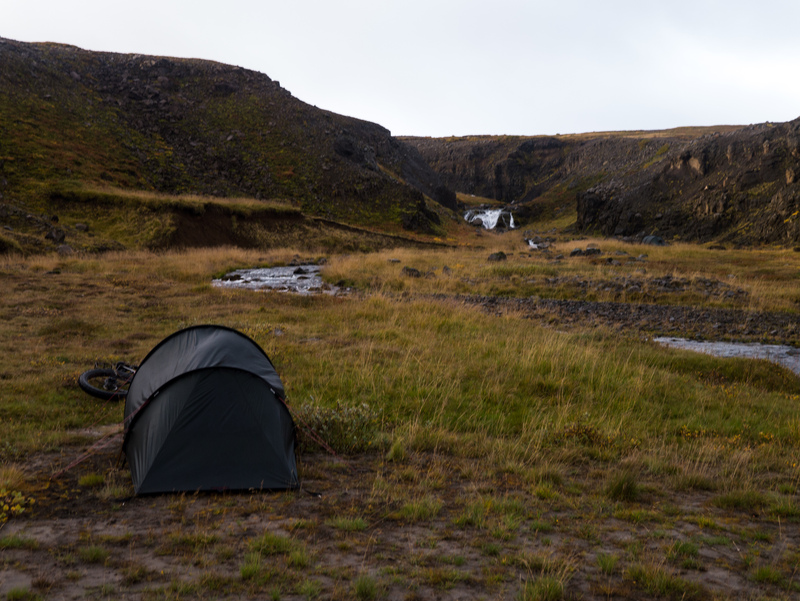 Eventually, I set up camp next to a small waterfall, racing quickly to get my tent up before my heart rate dropped and I lost body heat. It’s hard to take pictures of the wind, but you can see my “rigidly” pitched tent billowing in this little slice of paradise. Getting more and more barren up here. 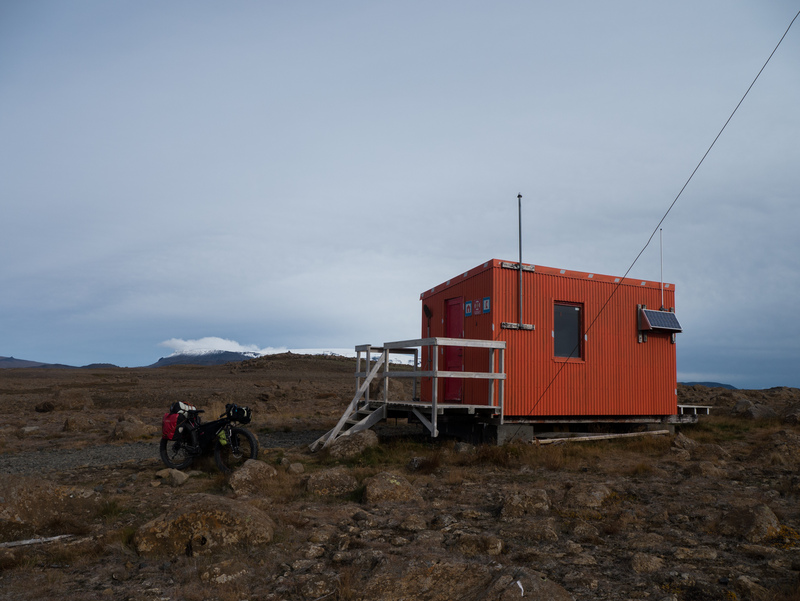 The next day I stopped by the small tourist outpost Husafell before heading up north of the Langjökull glacier over the Storisandur desert. This desert is a high volcanic plain, and it’s absolutely wild. One more short-ish day brought me to the precipice of the plain, and began what would turn out to be one of the more exhilarating experiences of my life. Up here, I strung a few days days of complete isolation in the wilderness, with no human contact and just me vs. the road. But I’ll leave that for part 2, because this post is getting long enough. Campsite for day 6, I think? I hope you all have a nice long weekend! I’m currently eating everything in sight. I lost probably 6 or 7 lbs over the two weeks I was out.